Description: After having a Walbridge yard crew get on back at the yard, N82028 with BNSF 9693 & 9259, heads north for CNs Lang Yard, and a hand off sot it can continue to the DTE plant in Monroe, Mi. Title: Cream n Greens work a Empty coal train Nb. Description: BNSF 9693, BNSF 5851, & BNSF 5975 lead BNSF OEHSJ-25 for Saint James, LA. Description: BNSF 9693, BNSF 5851, & BNSF 5975 lead BNSF OEHSJ-25 to Saint James, LA. Description: A northbound BNSF train meets a southbound UP train on the ex MP at Grady Ark. Description: This is the best photo I got of this one. All the shots from the front quarter are blurry until the train is well down the line. 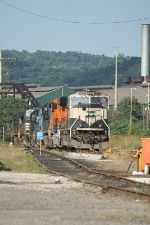 Description: Dpu on a loaded coal drag.